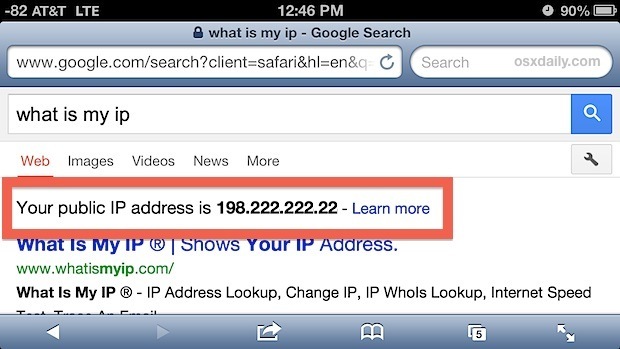 Because Google search now provides external IP address natively, you no longer need to visit some of the third party web sites to find this handy information. This really is the fastest way to get a public IP from any cellular equipped device that we know of. This is mostly useful for iPhone and cellular iPad devices that have some sort of server running on them, whether it’s SSH or otherwise, or if you’re looking to open connections on a router or firewall for specific IP addresses. If you’re looking for this info to set up IP filtering, keep in mind that the outside IP of an iPhone or any other smartphone is going to change much more often than a standard broadband IP, often whenever a cell device jumps from one cell tower to another. As you probably guessed, this trick works on the desktop as well, though it’s often faster on a Mac to retrieve from the command line instead.